UN Secretary General Kofi Annan has “strongly” condemned Israel for assassination of Hamas founder Sheikh Ahmed Yassin and warned that it could lead to further bloodshed, death and acts of revenge and retaliation. 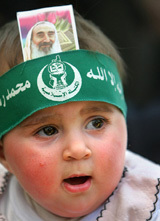 Israel was on heightened alert today after the assassination of Hamas spiritual leader Sheikh Ahmed Yassin sparked calls for bloody revenge from militant groups, the police said. Palestinian leader Yasser Arafat fears he’s next on Israel’s hit list after the assassination of Hamas founder Sheikh Ahmed Yassin, aides said. The US State Department expanded its list of foreign terrorist organisations to include Ansar al-Islam, a militant Islamic group that the US Government says has ties to Osama Bin Laden’s Al-Qaida network and carries out attacks in occupied Iraq. Ansar al-Islam “has been one of the leading groups engaged in anti-coalition terrorist attacks in Iraq”, State Department spokesman Richard Boucher said in a statement. At least 11 Pakistani soldiers have been killed in two attacks by militants linked to the Al-Qaida network in the northwestern tribal zone, security officials today said. China today announced unilateral suspension of all dialogues with the USA on human rights and summoned the US ambassador after Washington announced plans to table an “anti-China” motion at the ongoing session of the UN Human Rights Commission in Geneva. President Chen Shui-bian’s Democratic Progressive Party (DPP) today submitted a motion to Parliament proposing a revision of the election law to allow a recount if the margin of difference is under one per cent. The Israeli action, he said in a statement, violated the international law. “I do condemn the targeted assassination of Hamas leader and others who died with him,” Annan told reporters as he arrived at the headquarters yesterday. Such incidents, he added, are not only contrary to the international law but they do not do anything to help the search of a peaceful solution. Annan asked Israel to “immediately” end the practice of “extrajudicial” killings which, he said, is against international law. “The only way to halt escalation in the violence is for the parties to work towards a viable negotiating process aimed at a just, lasting and comprehensive settlement,” he said. Japan today summoned Israel’s ambassador over the killing of Hamas spiritual leader, describing the assassination as “a reckless act that has no justification whatsoever”. Chief Cabinet Secretary Yasuo Fukuda said the killing would only cause an escalation of violence in the Middle East. “We condemn the Israeli act. It will only intensify hatred and increase violence in the Middle East. We are strongly concerned about its serious impact,” Fukuda said. Indonesia, the world’s largest Muslim-populated nation, strongly condemned Israel for its “blatant” assassination of Hamas spiritual leader. “Indonesia strongly deplores and condemns the Israeli act, for which they must be held accountable,” foreign ministry spokesman Marty Natalegawa said. New Zealand said Israel’s killing of Hamas leader would damage the slender peace prospects in the Middle East and worsen the cycle of violence. Prime Minister Helen Clark in Wellington said while Hamas was known as an organisation that inspired people “to commit terrible atrocities. On the other hand I think few would see taking out the leader of that movement as a step forward towards peace. New Zealand Foreign Minister Phil Goff said less violence was the answer to peace in the region. 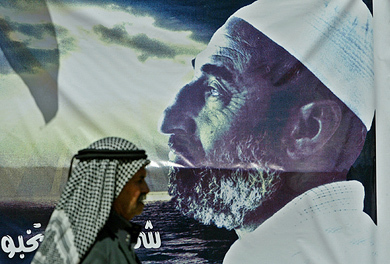 Arab television stations replaced scheduled programmes with live coverage of Yassin’s funeral. Mourners among a crowd of 200,000 reached to touch the flag-draped coffin in the biggest turnout in Gaza since Arafat’s triumphant entry in 1994 after interim peace deals with Israel. Reacting to the killing, Iran called it a “further example of the Zionist regime’s barbarity”. The army, police and domestic security service stepped up their level of alert in the wake of the helicopter raid that killed the cleric in Gaza City yesterday. 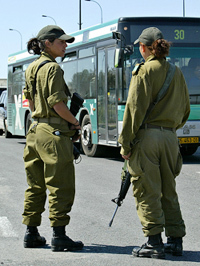 Police reinforcements were deployed in shopping malls across Israel and security was raised on buses, the police said, adding that the alert could be maintained for several weeks. Israeli cabinet ministers decided last night that assassinations of top Hamas leaders would continue. “We will do our utmost to face a possible wave of terrorist attacks in the coming weeks,” Israeli Defence Minister Shaul Mofaz told army radio today. The radio said security had also been boosted at Israeli embassies around the world, after Hamas declared all-out war against the Jewish state. Quoting military intelligence officials, the radio said Israel feared reprisals for the assassination might be carried out by foreign Islamist groups like Lebanon’s Hezbollah or Osama bin Laden’s Al-Qaida network. The Israeli army completely sealed off the West Bank and the Gaza Strip after the raid, that also killed seven other Palestinians. However, Israeli security officials say their focus is on Hamas — at least for now. Arafat expressed concern he too might be targeted, his aides said. “Arafat feels he is threatened and we feel he’s threatened because when they target Sheikh Yassin, they are not far from Arafat,” said Palestinian Communications Minister Azzam Ahmed, an Arafat confidante. The US State Department expanded its list of foreign terrorist organisations to include Ansar al-Islam, a militant Islamic group that the US Government says has ties to Osama Bin Laden’s Al-Qaida network and carries out attacks in occupied Iraq. Ansar al-Islam “has been one of the leading groups engaged in anti-coalition terrorist attacks in Iraq”, State Department spokesman Richard Boucher said in a statement. Boucher said the group trained in Al-Qaida camps in Afghanistan and had close links to the Al-Qaida. Ansar al-Islam also has provided a haven to Al-Qaida members in northeastern Iraq, Boucher said. The designation of Ansar al-Islam as a foreign terrorist organisation yesterday makes it illegal under US law for anyone in the USA or under US jurisdiction to provide material support to the group. The designation also requires US financial institutions to freeze the group’s assets and allows the State Department to deny visas to its members. In addition, three other groups — al-Aqsa Martyrs Brigade, Asbat al-Ansar, and the Salafist Group for Call and Combat — have been redesignated as terror organisations, Boucher said. Three soldiers were killed and four wounded in a rocket attack on an army camp in the tribal area of Parachinar today, a security source said on condition of anonymity. “The decision made by the USA to propose such a resolution destroyed the basis of dialogue between the two sides on human rights”. We have to put an end to the dialogues on the human rights issue.” Chinese Assistant Foreign Minister Shen Guofang told US Ambassador Clark T. Randit after summoning him. Announcing this at a regular bi-weekly news conference, Chinese foreign ministry spokesman Kong Quan accused Washington of turning a blind eye to the progress made by Beijing in the sphere of human rights in order to cater to the domestic political needs. “We do not want to see the human rights conference in Geneva turn out to a venue for confrontations,” he said, adding that China did not want to indulge in any confrontation. ‘’We have submitted our proposal to Parliament and it is expected to pass today,’’ DPP whip Chen Chi-mai said. Nationalist Party candidate Lien Chan, who lost Saturday’s presidential election by a margin of just 0.2 per cent, has demanded an immediate recount.